William Ross, a cat enthusiast, noticed a cat with unusual ears in his neighbor's yard in the Tayside Region of Scotland in 1961. The cat was a white barn cat named Susie. Her ears were bent forward about half way up and her face looked round and owl-like. A year later Susie and a tom cat had a litter of two kittens. The female kitten, who had folded ears, was given to William and his wife, Mary. The Ross' named her Snooks. The Ross' bred Snooks' son to a British Shorthair, thus beginning the Scottish Fold breed. In the early 1970's, Mary Ross arranged to ship some of her folds to a geneticist in Massachusetts. Soon the first American Scottish Fold litter was born. It's very important to only breed fold ear cats to straight ear cats. This produces litters with 50% straight and 50% fold ear cats. If a fold ear cat is bred to another fold ear cat, this can lead to kittens with degenerative joint disease. 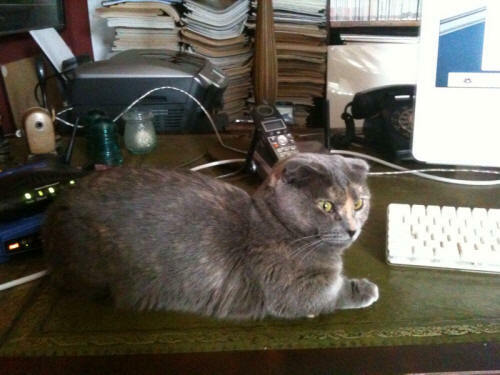 Scottish Folds are noted for their big, round eyes, round heads, short necks, and folded ears. 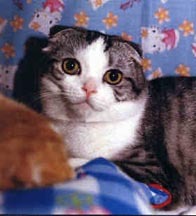 The original Scottish Fold, Susie, had "single fold" ears. The ears of today's breed can have anything from a loose, single fold to the very tight, triple folds seen in show quality cats. Scottish Fold cats are quiet and sweet natured. They like to play with you and be close to you. They adjust well to other animals in the household. Not only are they beautiful, but extremely lovable pets.